I was wondering if there they would like to let us know how AZ3 was coming along? If i remember correctly they wanted to release AZ3, strongholds etc by the end of this year thats why i was wondering now how far its coming along. PS Do NOT flame here as i just want to have some info as it has been a time since they gave a PvE update. I'm sure they would like, but it'd be bad for business to be honest. That is incorrect. Early 2018 they said/implied that they "cannot make any guarantees regarding PvE content this year (2018)". 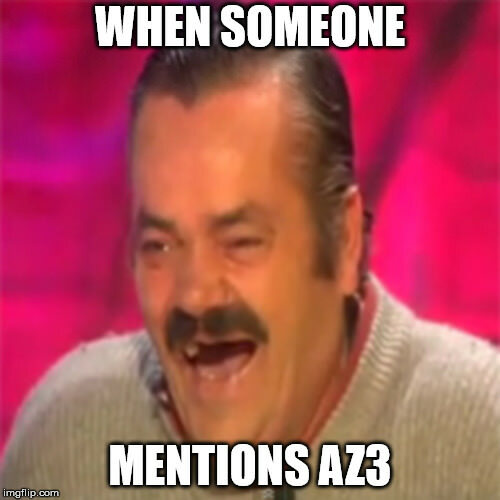 AZ3 was not brought up. They did imply that they'd try to do small PvE updates. Strongholds might've fallen under that. That all was during February/March '18. Unless you've been living under a rock, you'll know that HXE is struggling to continue existing and they are looking for additional financial aid. If you want to be honest with yourself, AZ3 won't come this year and HXE *might* only have weeks / months before they close, unless they find investors / buyers. The post was edited 1 time, last by Vroengard ( Jul 14th 2018, 6:47am ). There's a crumpled napkin in Cory's office with the words "What is AZ3?" in a drunken scrawl. No no they also apparently have the background art for tons of AZ3 dungeons. Tons. Remember that update where they got all of our hopes up that PvE was something they actually cared about and showed off that one dungeon? Ya..... but aside from that, the crumpled napkin is about it. Oh, and they've got a few buzzwords for it. Because Hex loves buzzwords. Cory's words are on Friday Update article, not the forum. I guess that means no one reads the main site either, oh well. The post was edited 1 time, last by Mokog ( Jul 14th 2018, 9:32pm ). Had no internet for 2 months so yeah i'm not completely up to date. However last i knew was that they claimed PS was doing great for business and that they managed to keep there head above water. After reading this it is i best dont spend any money anymore on hex it seems. I mean absolutely no disrespect to the OP, but... LOL! On a more serious note though, this is probably the wisest course of action for you as a player. I certainly won't spend a dime anymore, maybe not even if things pick up. On a related note, I don't think things will ever pick up again. I am currently trying to forget HEX exists, as this is the easiest way for me to cope. I will occasionally visit the forums, because it is therapeutic for me. I mean, if you enjoy what's there, then there's no harm in spending. I personally don't enjoy what they have right now... I've done the AZs too many times, and they're leaving Evo as set 9... but if you do, then go ahead. Just... do it realistically. Don't expect things to suddenly become amazing or complete... spend it for the fun you're having now. Some people have way too high standards... it's like... a game shouldn't have to be perfect or eternal or offer a return on investment for people to spend money. It should just have to be fun. If you enjoy your time, then it's worth the money. Simple as that. True but if the game is about to die and in that case probably taken offline than spending more money wouldnt be wise. I love hex even with its flaws, especially the PvE since hate having to be forced to play 3 fight for 1 battle in the competitive PvP. When we fed coins to the arcade, we knew it was for a limited time period too (3-15min usually). Noone will stop you from playing FRA and/or Campaign until whatever is to happen happens. Similarily, have you never gone to the cinema? Or an amusement park? Or to a musical concert? All of these have a time limit for your enjoyment. IF you want to play Hex PvE, that's the same principle. How wise it is depends ENTIRELY on how much you value 'having fun'. I bought a bag of chocolate bars. Those will only last me maybe 30 seconds each. Yet I bought them all the same. Was it wise? Well probably not. They're unhealthy, they won't last long. But... it's enjoyable eating them. I went to the movie last night with my wife. We bought dinner out, snacks, drinks, and tickets for a VIP theatre. All told, it probably cost us ~60-70 bucks for the night. We got maybe 4 hours worth of fun total, counting the whole evening. By your standards, that'd be very unwise. By mine... that was extremely wise. My wife had fun, I had fun, we have a new memory. If Hex were to introduce flashback Evo, I'd spend money. 5 bucks for a few hours of fun seems pretty good to me. All fun is transient... nothing is going to be fun forever. Nothing. You have to decide how much you value your fun. If you decide that the fun you get from Hex is not worth your money, then there's nothing wrong with that. But I wouldn't let the fact that the game is struggling play too heavily into that equation, personally. Because I judge my value by the fun I have now. If I can ALSO get fun later out of it, that's a bonus - not a necessity.